I need to fit a cylinder on the door; what size do I need? 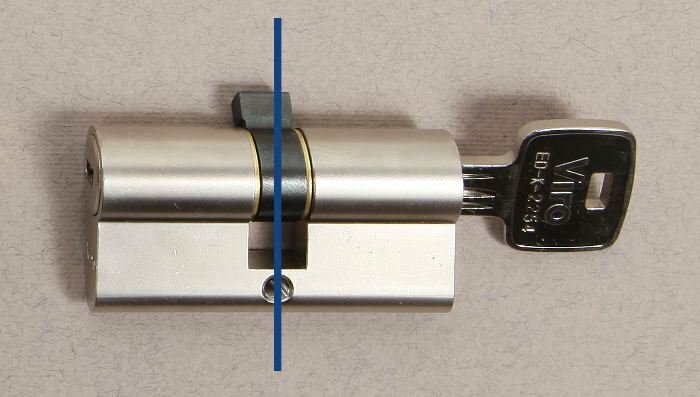 The first issue to deal with when you decide to install or replace a door cylinder is to choose the right size, even before thinking about the make and model. 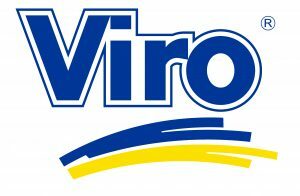 Suffice it to say that a cylinder such as the Viro Palladium is available in as many as 29 different sizes. Which will be the right one? In fact, it is quite simple. The are only two measurements that matter. We can think of a cylinder as ideally composed of 2 parts which are joined together at the hole for the fixing screw. A cylinder basically consists of 2 parts. The measurements that count towards a correct installation are the length of these two sides. 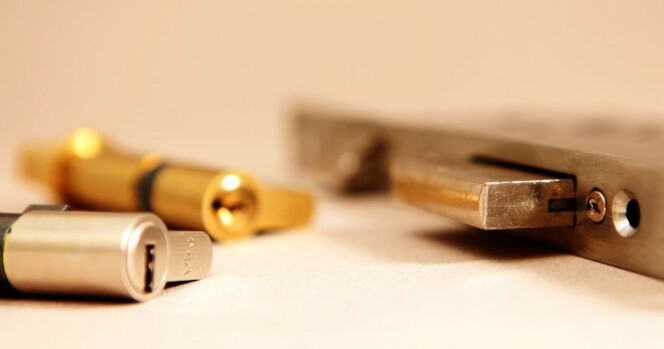 The measurements which are important are simply the lengths of 2 parts, which must be chosen in such a way that, once installed, the cylinder is, from both sides, flush with the door or any escutcheons present. In fact, if the cylinder remains encased, as well as being an aesthetic problem, we might have difficulty inserting and turning the key. On the other hand, if it protrudes from the door, you may run the risk of it being easily attacked with burglary tools in an attempt to break it and remove it. If we are replacing an existing cylinder we can use it as reference, although it is, however, advisable to check the correctness of the measurements. If, however, we are installing a new cylinder we have no other choice but to take measurements on the door. As can be seen in the figure, the correct measurements must be taken looking at the door profile, where the lock plate is installed, and by measuring with a ruler, or better still with a calliper, the two thicknesses (external and internal) starting from the hole for the screw which will fix the cylinder, up to the edge of the door (dimensions A and B in the figure). If there are plaques, plates or escutcheons present which incorporate the cylinder, it is necessary to also add, to each of the two thicknesses measured on the door, the thickness of those escutcheons or plaques (dimension C in the figure). The size of the cylinder will then be the sum of the thickness of the door and that of any plaques or escutcheons (dimensions X and Y in the figure). If you do not fit a protective shield, that is, a security escutcheon, it is important to buy a cylinder long enough to ensure that the face of the outer side is as flush as possible with the surface of the door. Any projections may in fact be used in an attempt to grasp the cylinder with burglary tools, to remove or break it. 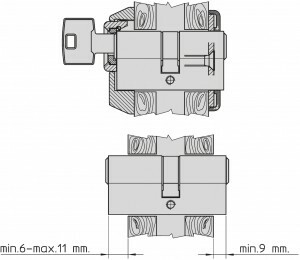 If a security escutcheon is installed, the length of the cylinder must be chosen in such a way as to ensure that the escutcheon adheres perfectly to the door, but without leaving a significant space between the outer face of the cylinder and the inside of the security escutcheon plate. 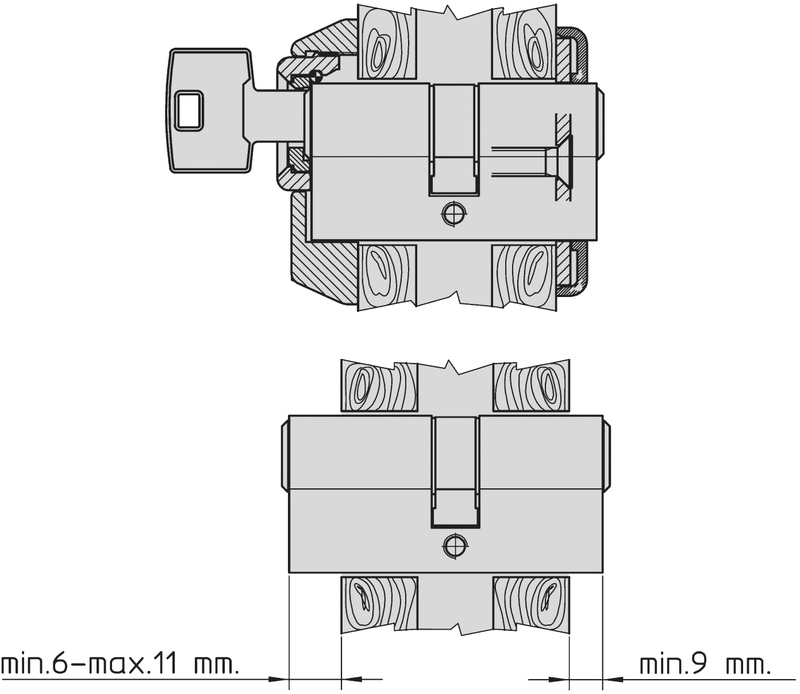 To simplify this coupling, the Viro security escutcheons (for more information see here and here) have a setting which allows you to recover any spaces (up to +/- 5mm) between the cylinder and the security escutcheon itself, and therefore adapt better to the projection of the cylinder. You just need 2 measurements and 5 simple steps to change the cylinder of a door. Old cylinders, as well as suffering from problems of wear, may be ineffective against new techniques of attack and tampering. So why not increase your security by changing the old cylinder with a more modern one? As of today there are no more excuses! This entry was posted in Locks and Cylinders and tagged products, tips on 20 October 2015 by calessandrini.